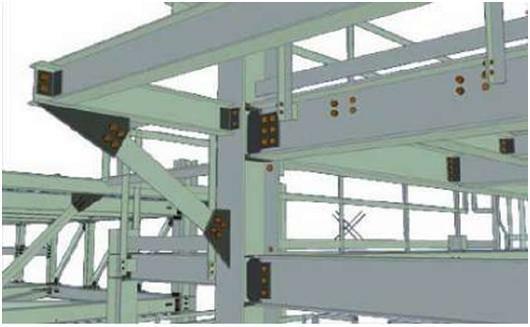 Tekla Structures is a tool for structural engineers, detailers, and fabricators. It is an integrated model-based 3D solution for managing multi-material databases (steel, concrete, timber, etc.). Tekla Structures features interactive modeling, structural analysis and design, and automatic drawing creation. necessary for manufacture and construction. The 3D product model includes the structure’s geometry and dimensions, and all the information about profiles and cross sections, connection types, materials, structural analysis, etc. Up-to-date drawings You can automatically produce drawings and reports from the 3D model, at any time. Drawings and reports react to modifications in the model, and are always up to date. Tekla Structures includes a wide range of standard drawing and report templates. You can also create your own templates using the Template Editor. Tekla Structures supports multiple users working on the same project. You and your partners can work together on the same model, at the same time, even in different locations. This increases accuracy and quality, because you always use the most up-to-date information. • Useful modeling tools, such as 3D grids, adjustable work area, and clash checking. • Catalogs of available material grades, profiles, and bolts. • Modeling tools to create complex structures, such as staircases and trusses. • Intelligent connections, such as end plates and clip angles, to automatically connect main members. • A custom component editor that you can use to create your own parametric connections, details, and parts. • Links to transfer data between Tekla Structures and other software, such as AutoCAD, STAAD, and MicroStation. • Drawing wizards to create several drawings with one click. • Data output for CNC machines. If you need assistance when working with Tekla Structures, use the F1 key to quickly access the context-sensitive online help. The online help is a comprehensive source of information, with full-text search and easy navigation. Tekla Structures also supports undo and redo, so you can test solutions, and revert to the original, if needed. Tekla Structures is used worldwide. It is available in a wide range of languages, and adapted to local requirements. When you install Tekla Structures, you can choose the language(s) and the environment(s) you want to use. • Spanish (esp) Some language-dependent file and folder names include the abbreviations listed above. The language in which you install Tekla Structures will be the default language of the user interface. To change the language of the user interface, click Tools > Change Language… , select a language, and then click OK. Restart Tekla Structures for the change to take effect. material names, default values, connections, wizards, variables, reports, and templates you use. Tekla Structures can be used in either single-user or multi-user mode. During the installation you are asked whether you want to install the multi-user facility. Single-user mode When one user at a time is to work with a model, Tekla Structures should be run in single-user mode. In single-user mode, only one user can work with each model at any time. Multi-user mode If several users will work with a model simultaneously, you can choose to run Tekla Structures in multi-user mode. We recommend that you only run Tekla Structures in multi-user mode if the users will make use of the additional features of multi-user mode. To run Tekla Structures in multi-user mode, one machine in the network has to be set up as a server running the Tekla Structures server program. For more information, see Multi-user mode in the online help. Tekla Structures includes the following editors: Model, Drawing, Symbol, Template, Custom Component. models, and initiate drawing and report creation using the Model Editor. when you open any drawing. and templates. To open the Symbol Editor, click Tools > Symbols… in the Model or Drawing Editor. Template Use the Template Editor (TplEd) to create and modify templates used in drawings and reports. To open the Template Editor, click Tools > Templates… in the Model or Drawing Editor.